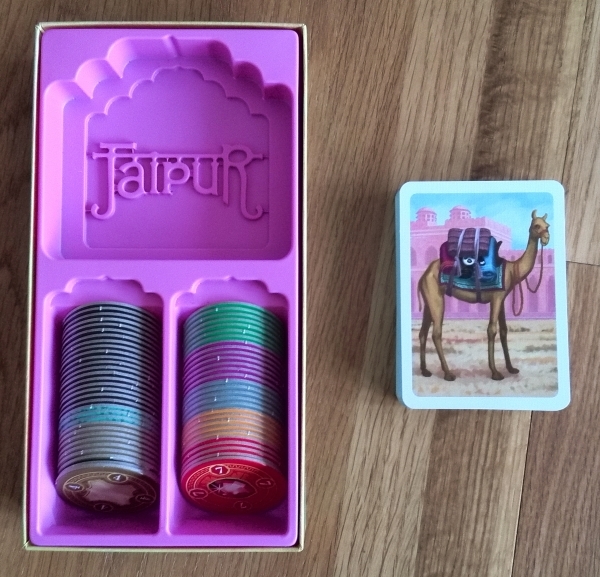 Jaipur is a set collection card game for two players. It comes in a small box and plays out in about 30 minutes, making it a great holiday game (however the 55 cards and 60 cardboard tokens do take up quite a bit of table space when laid out, so it might be tricky to play while you’re actually on the move). It also retails at a great price, around £15. The whole package is really nicely designed, with reasonably chunky cardboard tokens and good quality cards all fitting nicely into the box. The games (pasted-on) theme sees you as two rival traders, trying to make the most profit in the markets of the Indian city Jaipur. The art does a really good job of evoking this, while even the box insert keeps it going – a nice touch. Set-up is a little fiddly if you do it properly, but doing so does make the game run smoother and is certainly recommended. You’ll also have to go through most of this again after each round, but once you both know what you’re doing this can be done co-operatively without it being much of an issue (a couple of minutes at most). 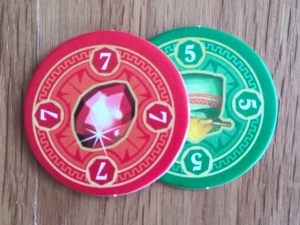 During the game there will always be five face-up cards to choose from: If you take one good, it is replaced from the top of the deck – if you take more than one good, they are all replaced either with other goods already in your hand, or with camels (see below) from in front of you. Alternatively, instead of taking cards, you can trade in cards from your hand for the appropriate Victory Point tokens. That’s it. The game concept is super easy: draw cards, collect sets, use sets to buy victory points. However some well devised mechanisms (see below) make for a surprising amount of tricky decisions each round. So, while really great luck on the draw can be insurmountable for your opponent, over three rounds the better player tends to win. The game plays out in what amounts to roughly three 10-minute rounds. 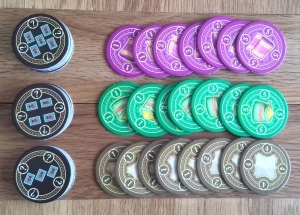 This is great for teaching, as it’s very easy to play a sample round and start afresh (good if you’re playing someone hyper competitive who really does want to try and get that win in game one!). Also, there’s nothing stopping you carrying on for more rounds – or having a quick single round game (although the set up may be a bit much for a one-shot round). While Jaipur is a fairly simple game to teach, there are a few nuances that people tend to keep forgetting (either deliberately or not, depending on how cheaty your group is!) – the classic being that if you only take one card, you must replace it from the top of the deck (not your hand). Thankfully the well laid out rulebook lists all of your options for a turn in the centre spread, which you can leave out on the table for easy reference. The writer: Its hard for a set collection game to stand out, but Jaipur manages it thanks to a few neat ideas. Alongside the goods cards are the camels. On your turn you can take all the camels available, which then sit in front of you as trading chips but don’t count against your hand limit. Useful, as this can significantly increase your bargaining power for a round or two. But you have to take them all – which could leave some great cards open for your opponent. The thinker: Hand management is the key factor and what sees a good player usually beat a bad one. Your game should be played as much in your opponents hand as your own, as you watch to see when they’re in a poor position to profit from a big play of your own. Sometimes you can also manipulate how quickly a round ends, either extinguish certain goods if you have a strong start (three empty stacks ends the round), or holding on to cards to keep the game going if you’re not. The trasher: I’d never ask for this one to come off of the shelf, but it is one I’ll play as a filler. While the theme is a bit boring and there is little actual player interaction, there are usually some good chances for clever opportunistic play; grabbing a single five-point VP token with a card just when you know someone is about to grab a set of them on their turn, taking their score tally down by that amount, is very satisfying! But more than the occasional game and I’m soon getting bored. The dabbler: Love it! Jaipur is simple to play and learn, while also being a doddle to teach. Any game where you’re flipping cards over into a draw area leads to ‘oohs’ and ‘aahs’ and this is no exception, with players constantly cursing their luck or revelling in a lucky draw. The art is cute and colourful (you’ve got to love that one camel has a little bear hidden under its saddle!) while the playing time is just right. In fact, its a game I’ll happily play several times in a row – especially when you want to have a chat and don’t want too much brain burn of an evening. It’s hard to find a negative review of Jaipur, and for good reason: it is a solid two-player card game which adds an easily digestible level of innovation to a style of card game most people will be familiar with. Add solid art/theme, the right play length and a nice price point and you have a real winner. One complaint, that its only two-player, seems desperate. If anything the hobby needs more two-player games that are accessible such as this, as they’re perfect for encouraging both children and non-gaming partners or friends into trying the hobby when there just happens to be two of you sitting around on a rainy day. The other, the strong luck factor, is perhaps more valid. However at 30 minutes Jaipur is clearly a filler – and a filler without luck seems to miss the biggest point of fillers. And I would still argue that a good player will win most games overall, even if its more often 2-1 than 2-0. If anything, I see that as a good thing. If you’re someone who likes card games and sometimes finds themselves in a situation where a good, short two-player game would fit the bill, I would highly recommend Jaipur to everyone: gamers and non-gamers alike. And it’s very much a family game too – and it’s unlikely to scare off even the most tragic anti-geek. Jaipur oozes quality, without stinking of nerdiness: this is the kind of game WHSmiths should stock and it wouldn’t look out of place on its shelves. Despite all the praise though, I’m only rating it a 7.5. Because for all its quality and gateway goodness, there isn’t quite enough game in Jaipur for me to want to pick it off of the shelf when it’s my choice to play a game. Strictly for two, for example, I would rather reach for Blokus Duo or Jambo if I had my way. But that doesn’t detract from Jaipur’s quality and it scores high marks right across the board for me. And while it isn’t the highest ranked game in my collection, I wouldn’t change a thing about it – nor would I trade it away. This entry was posted in Board games, Games and tagged Board game review, boardgame review, card game review, Jaipur, Jaipur review by Chris Marling. Bookmark the permalink. For my wife and me, Jaipur is one of our very favorite cocktail-hour games. We never get tired of it. Agreed 🙂 Have you played Jambo? The decisions are a bit more tricky and there’s a lot more text, but once you know the cards its another great two-player small box game. No, I hadn’t heard of it! I’ll check it out. I’ve recently picked this up and am really enjoying playing it with our children, as it has enough thinking in it to not totally turn off my 12 year old Race for the Galaxy loving son, but at the same time is approachable for my 9 year old Love Letter obsessed daughter. I really enjoy the format you chose, giving input from multiple points of view, so I’m looking forward to more. All I can say is… Merv Griffin!!! !